Every creative writer gets asked the question at least once at a social event with non-writers: “Where do you get your ideas?” To the asker, writing is a dark art, full of mysteries only the initiated understand. To the writer—as Neil Gaiman tells us in an essay on his website—the question misses the point and misjudges the writer’s task. “Ideas aren’t the hard bit,” he says. Creating believable people who do more or less what you tell them to is much harder. And hardest by far is the process of simply sitting down and putting one word after another to construct whatever it is you’re trying to build: making it interesting, making it new. Sometimes hardest of all is the “simply sitting down” and writing when there’s nothing, no ideas. The work’s still got to get done, after all. Gaiman used to treat the question facetiously, answering with one of a few waggish and “not very funny” prepared answers. But people kept asking, including the seven-year-old classmates of his daughter, and he decided to tell them the truth, “I make them up, out of my head.” It’s not the answer most wanted to hear, but it’s the truth. As he inarguably shows, ideas are like opinions: “Everyone’s got an idea for a book, a movie, a story, a TV series.” And they can come from anywhere. Gaiman, feeling that he owed his daughter’s classmates a thoughtful, detailed answer, responded with the below, which we’ve put into list form. Ideas come from asking yourself simple questions, like “What if…?” (“you woke up with wings?... your sister turned into a mouse?.... ), “If only…” (“a ghost would do my homework”) and “I wonder….” (“what she does when she’s alone”), etc…. These questions, in turn, generate other questions. Granted some of Gaiman’s examples may be more intriguing or fantastic than what you or I might propose, but anyone can do these exercises. The idea, however, is just the starting point. “All fiction,” he writes, “is a process of imagining.” So what comes next? “Well,” says Gaiman, “then you write.” Yes, it is that simple, and that hard. 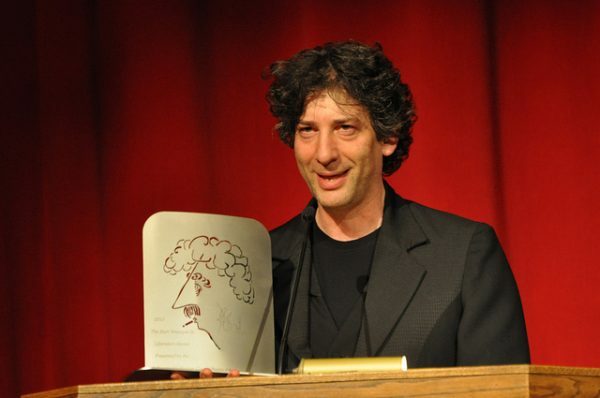 Tell us, readers, do you find any of Gaiman’s idea sources helpful? Where do you get your ideas? Rod Serling: Where Do Ideas Come From? It’s nice to hear a relevent contemporary author like Gaiman reaffirm the idea, originally from Aristotle’s Poetics, that plot springs organically out of an idea. That said, I read similar writing advice all over and what is harder for me is formulating coherent and fresh ideas. Does anyone know of any resources that could help in that area? I think the coherence of an idea is determined by the process of actually making it tangible (writing it). And there are no completely fresh ideas (originality is a very debatable concept). nnnWhat I took from Gaiman’s reflections are that when you engage in creative writing, ideas can very much sprout out any moment, but the most difficult challenge is to actually giving it a form in the papers, and that is also what I think you mean by having the challenge of “formulating coherent and fresh ideas.” nnnPersonally, I think of ideas all the time, but I would discard most of them; the ones that are fortunate to be written, well, there are but only a handful, and that is the hardest job of all.